Andy was standing by the screen again this morning. I don't know if he is the one who starts calling at 5 am or not. Cleaning the room today will be more difficult than before. I have soda boxes everywhere so they can choose the one they want. So far they move in and chew it up then move into another. I have a bag of alfalfa in the room too. If an egg is laid it is thrown out into the room. I can't tell who is doing what. Again this morning Gimpy came out of a chewed up soda box. It would be so wonderful if he actually had a mate. He deserves every blessing he gets. With all the soda boxes laying around I found Maggie behind the door. Come to think of it that may be why Andy is always at the screen door. She is right behind the door. This is not a good place to nest because the babies go under the door and separate from the nest. I will have to work with them today. Myrtle is hormonal but only shows it when she comes to my shoulder in the morning to do her hormonal dance. Other than that she does not seem hormonal. I will have to scoot my knees when I clean that room today just as a normal person would have to scoot their feet in a crowded room. This is going to be an adventure. I hear you on the 'scooting' the feet! It's what I have to do when I walk into my bathroom because of the kittens I am raising and all their toys strewn all over the floor. As to the boxes getting chewed up and the birds moving to another one, try putting a smaller box inside a bigger one -that's what I do for the zons and Linus Too. Liquor stores always have lots and lots of nice, strong cardboard boxes to give away. I swept up 7 eggs when I swept the cockatiel room yesterday. I don't sweep every day so that they can be happy in their own mess and empty shells along the base board. They have been laying eggs in the boxes then turning the boxes on their sides to kick the eggs out. I have been collecting them and putting in the frig in case I need to boil and replace fertile ones. Liz, don't wait. Boil the eggs [but let them get to room temperature and put them in cold water for boiling so they don't crack when cooking] and put them back in the boxes even if they do kick them out. I don't know if tiels are able to count or if it makes a difference to them to have the eggs there when they kick them out but better safe than sorry! There is a blood splatter on the baseboard in the cockatiel room. It looks to be about 2 tablespoons of blood. None of the cockatiels are injured and none have any blood marks. I have thought of everything and cannot come up with what happened. If a mouse got in and they dealt with it and ate it there would be blood on the Tiels. There would be blood on an injured Tiel. Cockatiels would not attack a mouse, Liz, so the answer has to be something else. Are you sure that none of them was hurt? Did you check each one of them, in your hand, blowing on the feathers to look at the skin all over their bodies? Or, did you, by any chance, give them something red to eat? Because, depending on what it is that they eat, they would, sometimes, produce poop that leaves a stain that looks as if it was blood. I am pretty good at remembering what I feed them but, believe it or not, even after all these years, I sometimes get startled for a split second when I first find the red poop and before I remember what I fed them the day before. It is a true mistery. I checked each one. I cannot hold all of them but could get on the floor with them to check each one. There is nothing wrong with them. They do not like red foods so that is ruled out. I guess I just need to be grateful that they are ok. I had a memory flash back. I don't know if it is in the past part of this thread but it made me laugh again. My bedridden mother made me promise not to get anymore critters. I promised her because I had gotten Myrtle the day before. 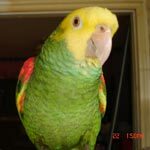 She did not know for 2 weeks until while Rainbow was with her she heard another parrot in the distance. She wanted to see it so I brought her in on my shoulder. Of course Myrtle would not go to her because she was barely coming to me. One day when I took her for my mother to see, my mother had pink curlers in her hair. Myrtle jumped down on the bed and ran up it. She proceeded to popping the curlers out of her hair and throwing them on the floor. Mom had to hold back on her laughing to keep from scaring Myrtle. Needless to say mom fell in love with her that day. They do the funniest things, don't they? And they are soooo smart! I am always in awe of how much they understand of what we say and do. Javi was making this 'special' call he has that sounds like JJJJJJJJJJ [almost like a hiss but not quite] over and over while I was finishing the cages in the dining room so I asked him: "What's the matter, Javi? Are you hungry?" and Sweetpea, which was perched on the budgies cage in the living room [about 12 ft away from me] quickly says: "Go home! Eat it!" which is the command I give them when I serve the gloop in their cages so they would go back into them and eat their breakfast. He had not only understood that I had asked Javi a question about his 'behavior', he had also made the connection between the word 'hungry' and the phrase he uses for food, namely 'eat it', and was offering Javi the perfect solution for his 'problem' - is that smart or is that smart? !